If you happened to be channel surfing this past Monday night, you may have caught glimpses of the gorgeous white sand and turquoise water that are the natural calling cards of the Caribbean island of Anguilla (shown above at left; courtesy of CuisinArt Resort & Spa). This photogenic isle proved to be a soothing background to all the human drama on the ABC reality TV series, The Bachelor. Fans of the series are certainly curious about the spots visited by Bachelor Brad Womack and the six remaining ladies vying for his heart, but even non-fans should know that Anguilla is an ideal locale for a romantic spring getaway – when there are just two of you! Here’s a rundown of everything featured on The Bachelor, plus a few additional suggestions. Resorts: The cast stayed at CuisinArt Resort & Spa, a 93-room property with Greek island-inspired architecture (shown at right; courtesy of CusinArt Resort & Spa), a long white-sand beach and a tranquil Venus Spa. CuisinArt is offering “The Bachelor’s Journey” package, which includes five nights in a beachfront suite, VIP airport pick-up and semi-private boat transfer, Champagne upon arrival, breakfast for two daily, four romantic dinners at various resort venues, a “Couples Rendezvous Journey” at the spa, and a one-day car rental. Package rates start at $5,105, but dip to $3,980 on April 1 and $3,580 on May 1. 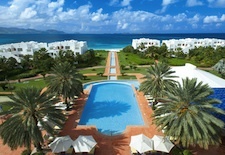 Other resort options on Anguilla include: Cap Juluca, a sprawling 97-room property on a wide crescent beach, from $595/night after April 4 and $495/night after June 1; Viceroy Anguilla (www.viceroyanguilla.com), the island’s newest five-star resort, with 166 rooms and sleek, contemporary design, from $595/night after May 1; and Ku, a more pocketbook-friendly option with 27 rooms overlooking Shoal Bay East, which is widely considered Anguilla’s best beach (shown at left; courtesy of Ku), from $220/night starting on April 1. 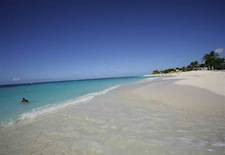 The Locations: Filming of Brad’s dates with the remaining ladies took place all around the island, which measures just 35 square miles but has an impressive 33 named beaches. His first date, via helicopter, was with Emily on the small spit of sand known as Sandy Island. His second date, a bicycle ride with Shawntel, was through The Old Valley, followed by a post-sunset rendezvous at Dune Preserve, a night spot owned by one of the Caribbean’s best-known musicians Bankie Banx (www.bankiebanx.net). And his third date, with Bree, was at secluded Little Bay, where they bravely jumped from cliffs into the crystal-clear water. The final rose ceremony took place at Le Bleu Villa (www.villalebleu.com), a private seven-bedroom home located in the Little Harbour Estates.